At least one person has been killed and others injured after a series of suspected gas explosions rocked towns north of Boston in Massachusetts on Thursday evening. Local police reported "fires and explosions" at dozens of properties. Hundreds of people have been evacuated, with gas and electricity services cut to try and prevent further incidents. A local fire chief described it as an "overwhelming event" that resembled "Armageddon". "I have been in the fire service for almost 39 years and I have never seen anything like this in my entire career," Andover Fire Rescue Chief Michael Mansfield said. 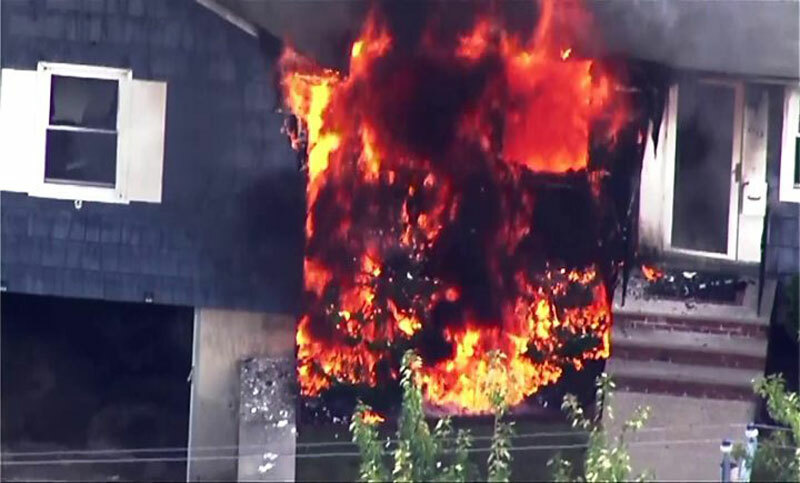 Officials have said that between 60 and 80 fires and a number of explosions broke out in homes and businesses in the towns of Lawrence, Andover and North Andover that are located approximately 30 miles (45km) north of Boston. Mr Mansfield said investigators suspected the fires were caused by "over-pressurisation of a gas main" belonging to Columbia Gas lines. The Governor of Massachusetts, Charlie Baker, described it as a "public safety event" in the early hours of Friday, but said officials were now "confident" there would be no further fires. The gas firm's parent company Indiana-based NiSource said its thoughts were with those affected by the incident. "The first priority for our crews at the scene is to ensure the safety of our customers and the community by supporting first responders and completing safety checks on our system and in the surrounding area," it said in a statement. Gas technicians are now going door-to-door with police and firefighters to check individual property safety. Lawrence Mayor Dan Rivera has asked all South Lawrence residents - even if they do not have Columbia Gas - to evacuate their homes until further notice. He described the community as "very resilient" but warned people to make alternative arrangements until they are told it is safe to return. A number of evacuation centres were set up for residents at local schools, which officials said would remain closed on Friday. Almost 18,000 customers were without power on Thursday evening because of the emergency switch-offs, according to the Massachusetts Emergency Management Agency. Neighbouring Police Chief Joseph Solomon, who came in to assist from the town of Methuen, said there were so many fires burning at one point that you couldn't see the sky. The State Fire Marshal's Office and the FBI are involved in the investigation, and the National Transportation Safety Board also plans to send a team on Friday.